On one Monday evening just a few weeks ago about 20 ladies from the South Dayton Ultreya gathered at the home of Maureen Russell to do something they have done for the past eight years around this time of year. 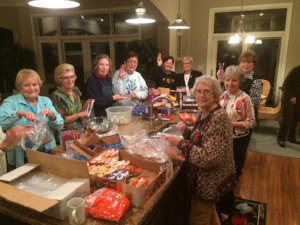 Since 2010 these women have been assembling bags of Halloween treats for the seminarians at Mt. St. Mary’s Seminary in Cincinnati. They started out with 30 and this year assembled 93 bags. In addition to the candy, cookies, chips, and gum, members of the Ultreya offered many prayers! This year members offered 165 Masses and 165 Rosaries for the intention of the seminarians. The South Dayton Ultreya prays for seminarians as a part of their apostolic action. Members make cards with a picture of each seminarian and pass them out so that each cursillista has “their special seminarian” to remember in daily prayer. In addition to the prayers, South Dayton Ultreya also educatd the seminarians about the Cursillo movement by including information on notes placed in the candy bags. In a small way, we are blooming where we are planted!